Robert Menzies succeeded Earle Page to become Australia's 12th prime minister when the United Australia Party elected a new leader following Joseph Lyons' death in 1939. Menzies returned to serve a second term in 1949 when the Liberal Country Coalition replaced the Labor government led by Ben Chifley. Robert Menzies is Australia's longest serving prime minister, holding a record which is unlikely ever to be beaten. Menzies learnt from his difficult first term as prime minister to go on to achieve a sustained and strong hold on the leadership of his party, and the nation, for sixteen years. Menzies began his political career grappling with the consequences of depression and war, and ended it managing the challenges of rapid post-war prosperity and growth. With a successful legal practice, and background in constitutional law, Menzies entered the Victorian Parliament in 1928. Transferring to Federal politics in 1934, Menzies won the seat of Kooyong for the United Australia Party (UAP). The death of Joseph Lyons in 1939 precipitated Menzies’ elevation to leader of the UAP and prime minister. Yet, against the backdrop of war, Menzies failed to retain parliamentary support and resigned in 1941. Menzies held on to the seat of Kooyong in 1943, even as Labor toppled the UAP. He continued to hold his seat until the Liberal Party won government in 1949 and a staggering sixteen years as prime minister followed. This term was characterised by economic growth, social change and political turmoil. The Cold War, attempts to ban the Communist Party and the Petrov affair all occurred on Menzies’ watch. He oversaw Australia’s alliance with the United States and expanded relations with Asia, signing the South East Asia Collective Defence Treaty (SEATO) in 1954. The Menzies government announced Australia’s entry in the Korean War and endured the backlash of entering Vietnam. On Australia Day 1966, Menzies voluntarily resigned as Prime Minister; he had instigated and adapted to more change than any predecessor. On 3 September 1939, following Germany's invasion of Poland, Britain declared war. British dominions, including Australia, made separate declarations of war on the same day. In January 1942 Robert Menzies began a series of weekly radio broadcasts for the Macquarie Network. 'The Forgotten People', aired on 22 May 1942, was a direct appeal to the Australian middle class. On 28 June 1950, Royal Australian Navy assets are committed to the Korean War, followed several days later by No 77 Squadron. On 26 July 1950, Australia is committed to ground operations in Korea. The Communist Party Dissolution Bill was enacted on 20 October 1950. The act was then challenged in the High Court and, on 9 March 1951, held to be unconstitutional. A referendum was held on 22 September 1951 on the issue of banning the Communist Party of Australia. A slim majority of Australians voted against the proposal. In April 1954 Vladimir Petrov, Third Secretary at the Soviet Embassy in Canberra, was encouraged by the Australian Security Intelligence Organisation (ASIO) to defect from the Soviet Union. Petrov and his wife Evdokia were offered asylum in Australia in exchange for information about Soviet espionage. On 27 September 1956, 'Operation Buffalo' commenced in a remote area of South Australia. This British operation involved the testing of four fission bombs. Nuclear tests continued at Maralinga until 1963. On 14 January 1960, the Reserve Bank of Australia commenced operations as Australia's central bank. Bark petitions from the Yolngu people of Yirrkala were tabled on 14 and 28 August 1963 in the House of Representatives. They became the first traditional documents prepared by Indigenous Australians to be recognised by the Australian Parliament under Australian law. On 24 November 1964, compulsory national service for the Vietnam War was introduced under the National Service Act. Selection of conscripts was based on date of birth drawn from a lottery, and conscripts were obliged to serve two years active service, followed by three years on the active reserve list. 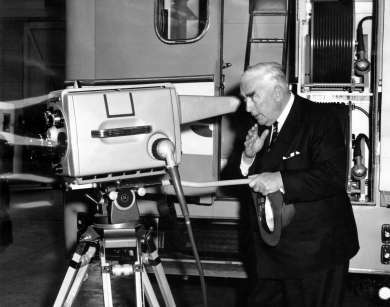 Prime Minister Robert Menzies peers into a new telecine camera in Adelaide, 21 September 1959. 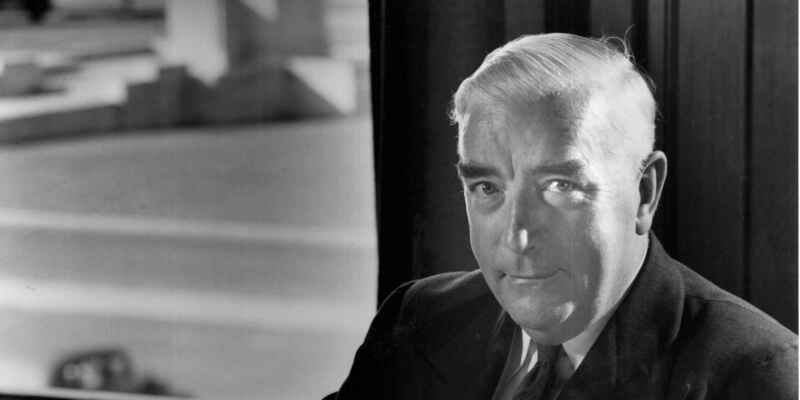 When Robert Menzies was elected leader of the UAP, he inherited not only the prime ministership, but also leadership of a coalition. So, when Country Party leader Earle Page refused to work with him, the UAP lost majority government. After the 1949 election, Menzies was forced to seek a double dissolution election for April 1951, when the Labor controlled Senate refused to pass legislation to nationalise the banking system. The Liberal Country Coalition was returned with a reduced majority in the lower house, alleviated by control of the Senate. The 1954 election became the Petrov poll, which Menzies narrowly won. He improved his position winning a snap election comfortably in 1955 against a divided Labor Party, and winning the first televised election in 1958. Following a recession and a very unpopular budget, the Coalition suffered heavy losses in 1961, retaining a majority by only one seat. In 1963, the Coalition regained these losses in the House of Representatives. Menzies’ first term had seen the passing of legislation such as the National Security Acts of 1939 and 1940, aimed at seeing Australia through the war. The early 1950s saw a continued focus on security and defence but, by the second half of the decade, Menzies presided over cultural, economic and social legislation including broadcasting legislation, various banking acts, uniform divorce laws and electoral reforms. Menzies was a parliamentary performer without peer; the Melbourne Herald journalist E.H. Cox described him as being ‘uniformly suave in the House of Representatives.’ He used language with eloquence and precision to convey an argument, but equally in service of a withering comeback against an opponent. Menzies record-breaking term in government ended with his retirement on Australia Day 1966, one of few Australian prime ministers to leave office on their own terms. As leader of the UAP during the early years of World War II, Menzies battled to retain support. Earle Page and the Country Party consistently used Menzies’ lack of war service to undermine his authority. As leader of the Liberal Party, Menzies had no such trouble. He successfully secured a renewed coalition with the Country Party for the 1946 election. For most of his lengthy tenure Menzies enjoyed a high degree of party loyalty, maintained stable ministries and never faced a leadership challenge. 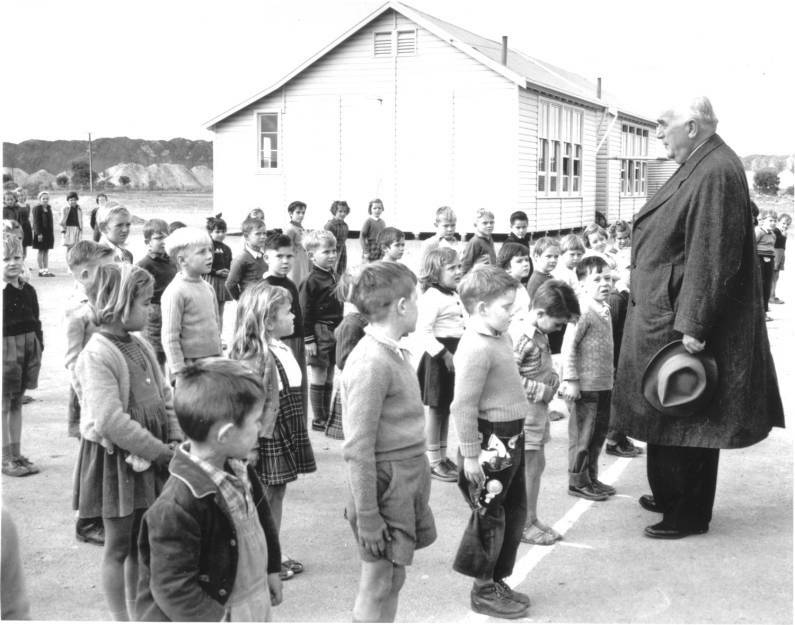 Menzies formed a close working relationship with John McEwen who became the leader of the Country Party in 1958. The partnership brought ongoing stability to the Coalition and, despite occasional party differences, this was to be a source of great pride for Menzies. Menzies as the ‘father’ of the Liberal Party received considerable respect from the party membership. His leadership of the Cabinet and party room has sometimes been portrayed as dictatorial and ruthless. The reality appears to be somewhat different; a number of Menzies’ colleagues have noted that on important issues there was always full discussion in which anyone who wished to speak could do so and was listened to by Menzies. Paul Hasluck stated that ‘Menzies had a far better mind than anyone else in and around the government… he could see more quickly and more exactly and accurately reach a conclusion after hearing the arguments.’ Menzies achieved his desired outcomes because he knew what he wanted, was a gifted proponent of his view and was recognised by many in his Cabinet and party as their best man. Papers of Sir Robert Menzies, 1905-1978. Robert Menzies and others in the grounds of the Indian Prime Minister's house. In 1959, Prime Minister Robert Menzies opened The Lionel Lindsay Art Gallery and Library in Toowoomba, Queensland. Lindsay was, by then, a prominent Australian artist whose reputation had grown internationally. A romantic at heart, Lindsay’s work often evoked images of the swagman in the outback and old colonial Sydney. Menzies opened the gallery as prime minister, but also as a close, long-term friend. Menzies believed that Lindsay had ‘enriched the artistic and intellectual’ life of Australia. Menzies greatly enjoyed the arts, taking opportunities to see shows and meet artists during his travels, as well as frequenting the bohemian Melbourne Savage Club, where artists mixed with businessmen and politicians. In June 1957, Robert Menzies set sail for England aboard the liner Arcadia. Off Cape Town, more than 1200 British migrants were able to see their new prime minister long before they would set foot on Australian soil. A pre-arranged meeting saw the Arcadia pass the Australia-bound liner Strathaird. Migrants aboard the Strathaird cabled greetings to Menzies, who responded by requesting the two ships pass as closely as possible. With less than 200 metres separating the liners, the migrants had a clear view of the prime minister waving. Menzies had supported post-war migration, welcoming Eastern European migrants and defending German migrants in an often hostile Australia. Yet, Menzies was an unwavering advocate of Empire, and responded warmly to British migrants such as those aboard the Strathaird. ...the tasks ahead of us will demand great efforts and a spirit of enterprise and co-operation from all sections of the community.